Valiant Entertainment Announces Bloodshot Holiday Sweater and T-Shirt! It’s that time of year when everyone hauls out their favorite holiday sweaters (ugly or not) to wear to every family gathering until the New Year. Valiant Entertainment has introduced a new holiday sweater and /or T-Shirt featuring one of its most popular characters – the nanite-enhanced super soldier, Bloodshot. Designed by Bloodshot artist Mico Suayan, the Bloodshot Holiday Sweater – and T-Shirt – are available now. VirtTrade to Make “Valiant Heroes” Collectible Card Game App! VirtTrade is partnering with Valiant Entertainment to create Valiant Heroes, a comprehensive digital collectible card game app based on the comic book publisher’s characters and titles. 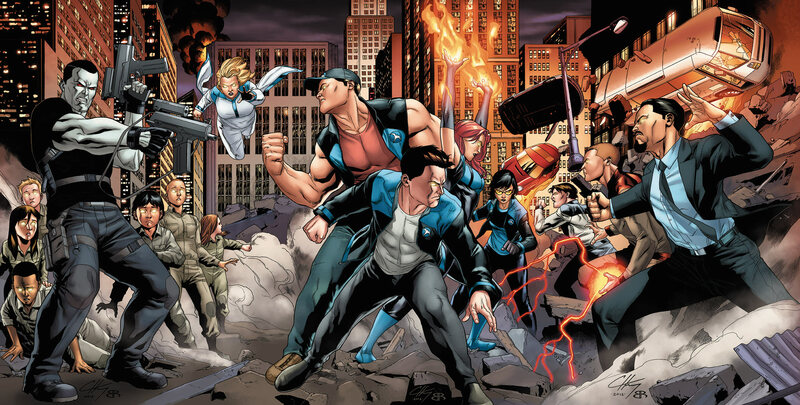 DMG Entertainment Acquires Valiant Entertainment! Valiant Entertainment, the world’s largest independently owned library of comic book-based IP, has been acquired by Dan Mintz’s DMG Entertainment. DMG (Looper, Iron Man 3) currently has the previously announced “Bloodshot” and “Harbinger” feature films and TV shows based on Valiant’s Quantum and Woody and Doctor Mirage in development. Valiant Signs 9-Figure Movie/TV Partnership With DMG! Valiant – home to a roster of over 2,000 characters including Bloodshot, Shadowman and Archer & Armstrong – has signed a partnership deal with China’s DMG. The partnership will span motion pictures, television publishing and licensing that will see the Valiant characters mentioned above developing for the big screen and others being developed for television. Tentpole films developed through this partnership would see simultaneous release in the U.S. and China. For further deals, follow the jump.